Thanks to Paola Crespo and the lovely people over at Orbit for an advanced reading copy of The Raven Tower by Ann Leckie in exchange for an honest review. Receiving this ARC did not influence my thoughts or opinions on the novel. Well, first off, this title colored me intrigued because it was by Ann Leckie. To hear that she was publishing her very first fantasy novel , and then upon seeing the gorgeous cover by Lauren Panepinto, I was all over it. Though I haven’t read her Imperial Radch series, I have heard amazing fantastical things about it. Not to mention she is also the winner of several awards including the Hugo, Nebula, and Arthur C. Clarke. So to say I had pretty high expectations going into it is an understatement. 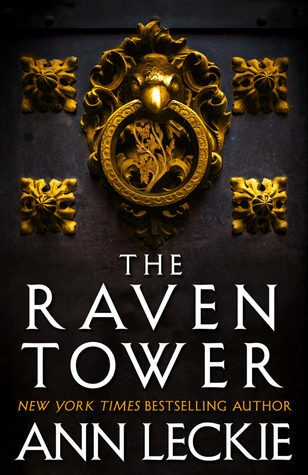 The Raven Tower is a unique and dark tale, one that, for me, is missing just a few key ingredients to make it something magnificent. Well, unfortunately, I was a little underwhelmed. I have been reading fantasy for a few years now (I know, humble brag) and feel like I have settled into a groove of what works and doesn’t work for me when it comes to good epic/grimdark/literary/etc fantasy novels. What absolutely doesn’t work for me is a lack of action, and boy does The Raven Tower lack action. The first half of the book is really just a build-up/re-telling of history up to this point in time and leads up to an ending that is decently satisfying. I mean, Leckie definitely does a fantastic job of leaving me wanting more by the end, but the trek to get there felt like climbing Everest, only to know you have to get back down. The book is written with a little bit of 1st person POV, told by the ancient God called the Strength and Patience of the Hill (which is mostly backstory), but a majority of novel is 2nd person where said God sees through and talks to a secondary character by the name of Eolo, even though Eolo can’t always hear what the God is saying. Basically, the God is narrating Eolo’s present life, giving us a glimpse into his story. Still no clue why the God has chosen Eolo as it’s primary talking stick, but I digress. The characters fell pretty flat on their faces for me. There isn’t one I can pick out of a lineup that I really felt for or continue to care about. It really just feels like a play where I am waiting for the 2nd act (and yes, the novel has a very Shakespearean feel with a spoonful of Hamlet helping the medicine go down). Even the Gods are pretty lackluster for playing with humanity like chess pieces, though to see man fight back with a little bit of gusto makes for an interesting last quarter. Overall, I can only assume Leckie has tons left to reveal is this story, but man do I hope she gets to it quickly. If I’m going to get through Book 2, I need some hackin’ and slashin’, some bloodied swords and heads on spikes. Maybe a God or two to duke it out over their next puppet. SOMETHING. Lack of action has gotten to be a huge issue in the traditionally published fantasy being released today (and most indie fantasy is similar). Yeah… not sure what to think of it. I feel like some authors, knowing they will get published, are trying too hard to push agendas and, in the grand scheme of things, are creating middling fantasy. I so hear you David… I’ve got a copy of this as well thanks to James, but I was left pretty disappointed. Didn’t know it was a series though… that would explain some things. But I don’t think I’ll read on nevertheless. I wrote that part in the review in the hopes that it was a series because I do believe the ending leaves plenty of unanswered questions. But yeah, pretty disappointing for what I expected to be a phenomenal read. Oh, gotcha. I wasn’t so kind in my review though, lol. Or with my rating for that matter. Practically nothing worked me and I was soooo mad, because I was waiting for months to get my hands on a copy and wanted to love it. *sigh* And it was the first read of the year for me too, lol. Thanks for your honest review, I’m always a little nervous when I see a Leckie book so I’ll probably pass on this. What are your thoughts on her previous titles? I’m interested now. Thanks. Yeah, it worked fine for me this time around but not sure I could do it for a series.